Gene Luen Yang’s New Super-Man began with a fairly straightforward premise: what if Kenan Kong, a regular teenager living in China, was suddenly imbued with all of Superman’s abilities and recruited by the government to fight crime? As the series has progressed, Kenan’s met a number of other teen heroes modeled after the American Justice League. But rather than merely just giving them similar power sets, New Super-Man is reimagining their origin stories in some truly fascinating ways. Naturally, New Super-Man begins with the story of how Kenan gains his powers and, as far as superhero origins go, it’s pretty standard issue. After accepting an offer to join the Chinese Ministry of Self-reliance’s Justice League of China, Kenan is put into a strange machine that gives him all of Superman’s powers. Kenan promptly loses control of his newly-acquired heat vision, prompting Bat-Man (Baixi Wang ) and Wonder-Woman (Deilan Peng) to step in and subdue him. As New Super-Man has gone on, Kenan’s gradually learned that as similar as his and Superman’s powers are on paper, how they tap into their powers is vastly different. Kenan’s powers regularly falter at various points in New Super-Man partially because he’s relatively inexperienced at using them, but also because they’re directly connected to his qi and spirituality. Both Bat-Man and Wonder-Woman’s powers are more or less identical to their American counterparts, but their origins are similarly reimagined in ways that are drastically different than the originals’. Bat-Man, we learn, isn’t a rich orphan running around in a bat suit, but rather was the top graduate from the Academy of the Bat, a competitive prep school where every student trains to one day become a masked crimefighter similar to Batman. Though we don’t get to see much of the Academy, it’s explained that the top pupil from the student body is awarded the cowl and the rest are granted the opportunity to challenge them for it at any point in time. When Baixi returns to the Academy to check in on his younger sister, he’s forced to accept a trial by combat that takes place in hard light recreation of Gotham city as the entire school looks on from afar. Of the Chinese Trinity, it’s Wonder-Woman whose backstory is the most drastically changed—and yet, it also has a lovely poetry to it that echoes Diana’s mythic origins in Themyscira. In New Super-Man #12 Kenan and Baixi learn that Deilan is actually the only one of the three of them whose powers are naturally hers because she isn’t actually a human. Deilan, it’s explained, is actually the legendary green snake from Legend of the White Snake, a traditional Chinese folktale about a pair of snakes who will themselves to become human. In New Super-Man’s telling of the myth Deilan was encased in stone for centuries after being cursed by a vengeful spirit. When she’s freed from the curse by the Chinese Ministry of Self-Reliance in the present day, she assumes her new identity and conceals her true form and the magical nature of her powers. 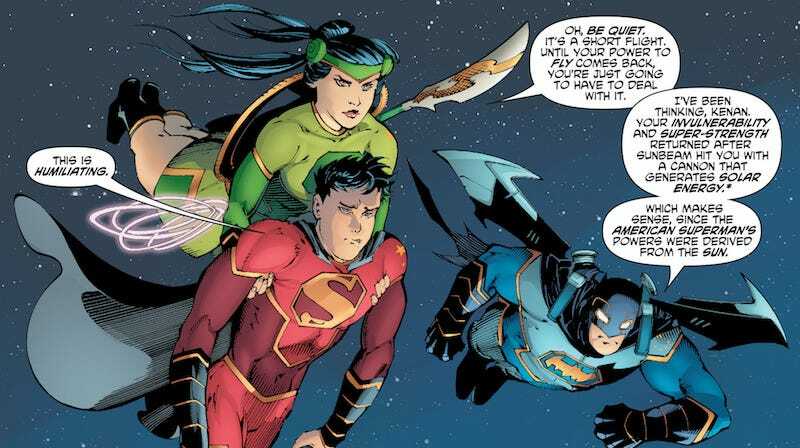 As New Super-Man continues, more and more riffs on the American Justice League continue to pop up. But rather than feeling like lazy retreads of familiar territory, each of these characters proves that the mythologies established by legacy comic books can be remixed and refreshed in a way that feel innovative, new, and fun.